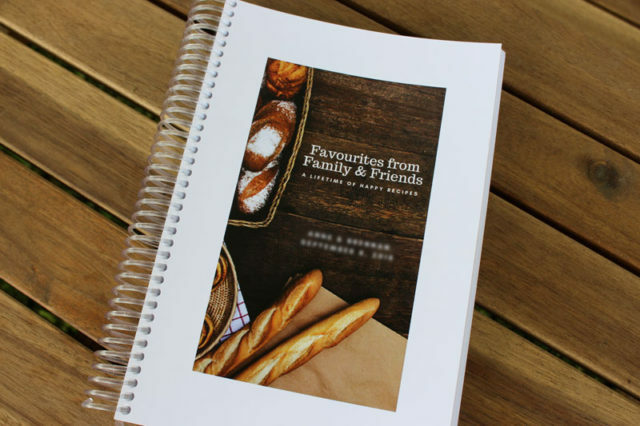 Create a memorable bridal shower gift by making your own group cookbook, filled with favourite recipes from family and friends. 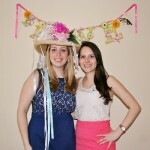 Earlier this spring I helped host a bridal shower at the farmhouse for my cousin’s upcoming wedding. 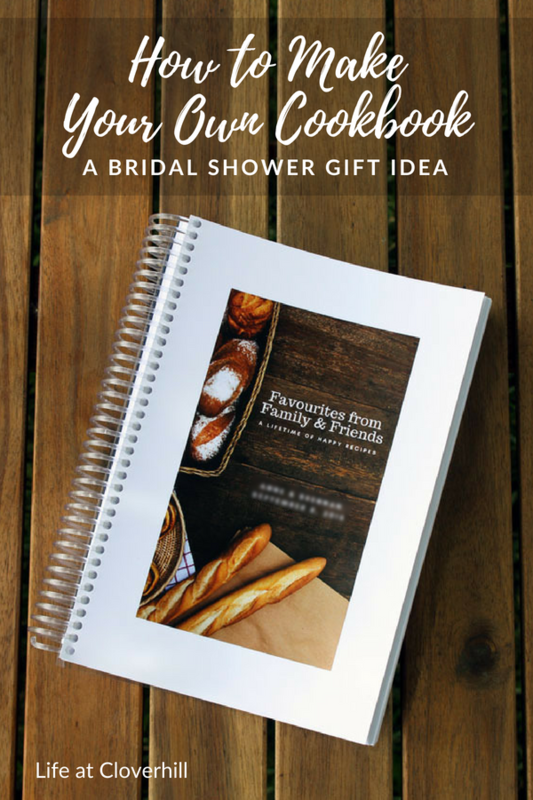 I recently shared the Lavender Sugar Scrub I made for the bridal shower favours, but the other DIY project I did for the wedding was pulling together this bound cookbook full of over 40+ recipes from guests of her bridal shower. I was inspired by the recipe cards my sister had sent out with the invitation to my own bridal shower, and how much I love having those treasured recipes from the women in my life. 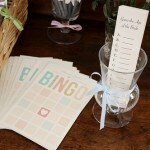 Putting together this cookbook was a great way for everyone who was invited to the bridal shower to participate, even those who were not able to attend. 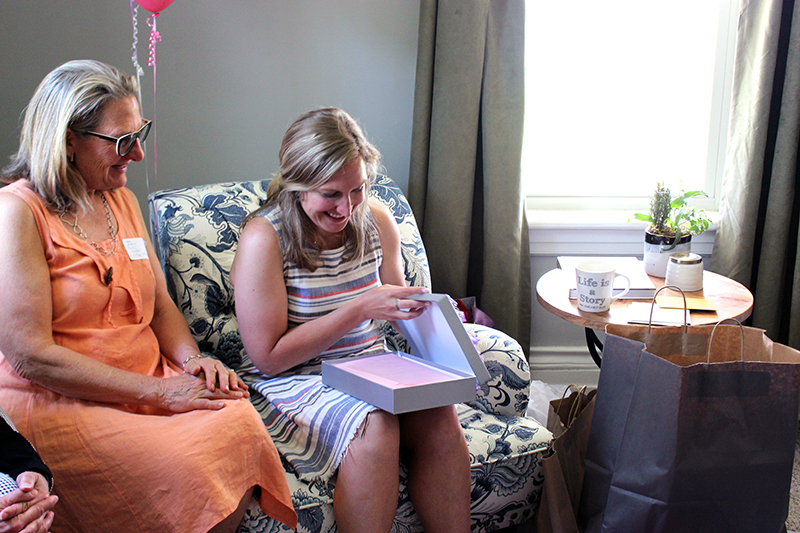 It was the first gift my cousin opened at the bridal shower and then we were able to hand it around for guests to look at while she continued opening gifts. The bride’s grandmother passed away last year and her mother found this sweet “recipe” for marriage in amongst her cookbooks, so I added it into this cookbook at the beginning. 1. 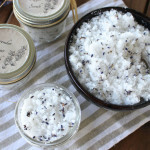 Compile the Recipes – I sent an email out to all the bridal shower guests with a Word document (which you can download below) that clearly outlined what I was looking for: recipe title, the guest’s names, the ingredients, instructions and a little about why they chose that particular recipe. I think that’s the part I loved reading the most – the little anecdotes and stories of how this recipe became special enough to want to share it with others. 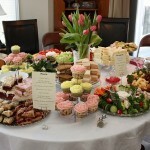 It was great to include recipes from both sides of the family and lots of friends too. Some of the recipes included that you can find here on the blog are my great aunt’s much loved Family Christmas Carrot Pudding and her lasagna, as well as my Nana’s Oatmeal Cookies (a recipe passed down from her mother), my mom’s Peppermint Bark, my own Easy Cherry Tomato Pasta and family favourite Northern Italian Bolognese Sauce. 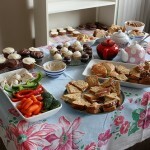 There were so many great recipe submission from everyone else that I can’t wait to try myself! 2. Set a Deadline – Make sure to let people know a clear deadline of when you need all the recipes submitted, at least a couple of weeks before the bridal shower. Be prepared to receive more after that deadline too. I also sent out a reminder a week before the deadline in case anyone had missed the first email or forgotten. I wanted to make sure that everyone who had a recipe to submit had amble time to do so. 3. 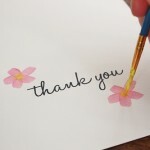 Encourage Variety – When people asked what kinds of recipes to include, I tried to give them ideas of what things would be nice in the book – appetizers, entrees, baked goods, salads, sides. I also let them know that the groom has a strict gluten-free diet, which helped us get lots of recipes that he could enjoy too. Some people sent more than one recipe too! 4. 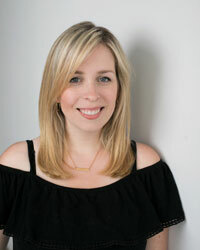 Allow Yourself Time to Edit – The one thing I will say is that even though I sent it as a Word document, it was sent back to me in so many different formats – Word documents, in the body of an email, Google Drive, Pages, weird text programs I’ve never used, etc. Some people did it as a clear Instructions + Ingredients layout, whereas others just had it all mixed in together. There were plenty of spelling mistakes or formatting errors too. I tried to clean everything up to look the same and have a cohesive look. Make sure you give yourself LOTS OF TIME to edit everything. 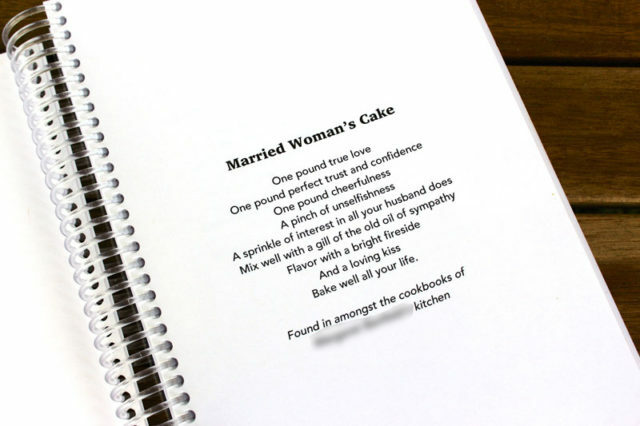 Once I had all the recipes in, I gave myself a week to get it compiled into the book and then had it into the printer at least a week before the bridal shower. I ended up having a printing issue (the binding was off), so that extra time was important to get it fixed before the bridal shower. I also saved money on printing but not having it be a “express/rush” job. 5. 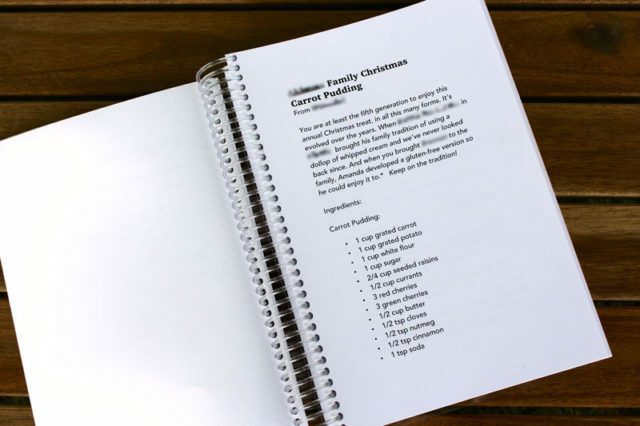 Decide on a Printing Format – I took out some of my favourite cookbooks and checked the sizing. Ultimately I decided on a 9″ tall x 6″ wide cookbook – a good size for leafing through in your hands, yet not too small that you can’t read it. I knew I was going to get it printed at our local print store, so I went in ahead to see what printing options they had. 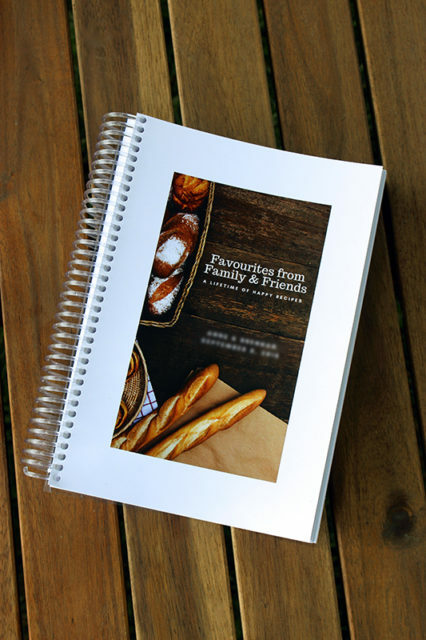 For the cookbook, I chose to do a clear spiral binding, with a plastic clear overlay, cardstock printed front cover, coloured plastic coated cardstock back cover and then one-sided thinner cardstock for the pages pages. My printer said that the easiest way to submit the document for printing and they suggested a PDF that was a standard letter paper size (11.5″ x 8″) with the margins made to fit where I wanted the print to be when the pages were cut down to 9″ x 6″. I used Microsoft Word and set the margins as follows: top 3″, bottom 0.5″, left 0.5″ and right 2.5″. This gave me a 0.5″ border around all the text – perfect for the bride to scribble little notes on any recipes if she needed to. I wanted the recipes to always start on their own page, so at the top of each recipe I selected “Page Break” from the options on Microsoft Word. I did this as I added each new recipe. To save myself time in editing, I made the whole document one-sided. It costs a couple dollars more in printing, but it was worth it to save the time in the editing process. 6. 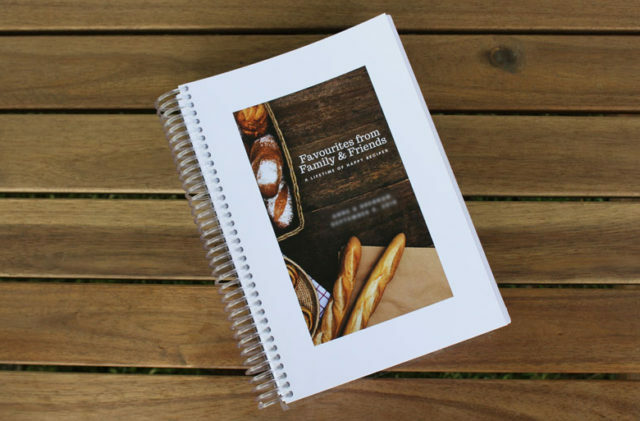 Make a Cover – I used Canva to make a cover for the cookbook. I set the dimensions of the file to be 8″ x 5″ so that it fit perfect in the margins I’d already set for myself in the document. I found a free stock image I liked of bread on a rustic table, and then added in the font I liked. 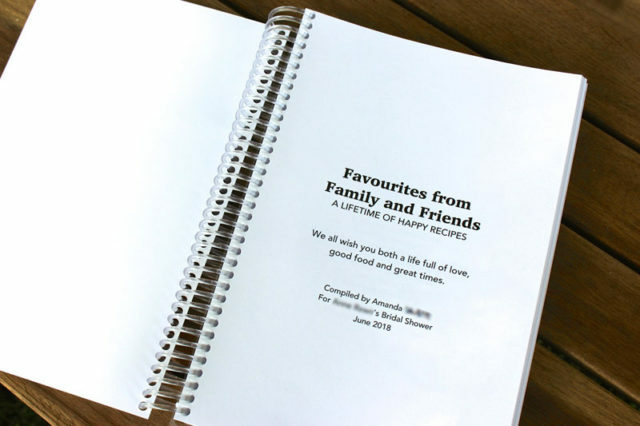 For the title I called it ‘Favourites from Family & Friends – A Lifetime of Happy Recipes” with the bride and groom’s names and wedding date below. On the first page inside the book, I added a little dedication from all of the bridal shower guests who contributed a recipe to the book. 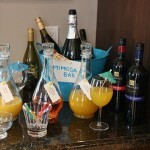 It was really nice to be able to pass the book around at the shower and let everyone see their recipes in print. Several women expressed an interest in having a copy of the cookbook for themselves. I made a full size (11.5″ x 8″) PDF version that anyone could print on their home printer and emailed it out to all the guests after the shower. I hope anyone out there looking to plan their own cookbook finds this helpful. If you have any questions please feel free to leave a comment below. 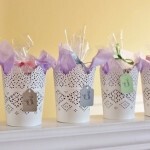 For more bridal shower and wedding inspiration, check out my Wedding section.